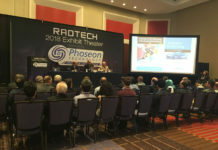 RadTech South America’s first UV LED Technology Seminar generated so much interest and positive feedback that another event has been scheduled for March 12. The Radiation Curing Program (RCP) at the State University of New York College of Environmental Science and Forestry (SUNY-ESF) has added a short course to its suite of online courses called Basics of UV Curable 3D Printing. Students will learn the language and concepts of UV-curing technology and how it applies to 3D printing. The various modules will provide a broad overview of the science, materials, equipment and processes used in UV-curable 3D printing. Short courses can be completed in four to six hours but can also be taken at the student’s pace during a four-week period. In addition to this course, registration is open for four other online courses, including an additional short course on the principles of energy curing and an advanced graduate-level radiation curing certificate program. For more information, visit radcuring.com. RadTech South America, São Paulo, Brazil, hosted its first UV LED Technology Seminar on Dec. 3, 2014. The dynamic event featured presentations, panel discussions and more, covering applications that included wood, offset, flexo and inkjet. Member companies who gave presentations included UVTronic, Allnex, BRChemical, Flint Group and Renner Sayerlack. Attendance was maxed out at 52 participants, who reported gaining a greater understanding of UV LED technology and its applications. The event generated so much interest and positive feedback that another event has been scheduled for March 12. For more information, visit atbcr.com.br. Abstract submissions for oral and poster presentations are being accepted for Photopolymerization Fundamentals 2015, the premier scientific conference for the industry, which will be held Sept. 13-16, in Boulder, Colorado. Highlights of the event will include numerous presentations in an atmosphere that encourages difficult material with unexplained results, a short course featuring four tutorial or review lectures from leaders in the photopolymerization community, as well as a poster session and vendor exhibits. Abstract submissions are due May 1, and early registration for the conference ends June 30. For more information, contact neil.cramer@colorado.edu or visit pfmeeting.org. RadTech International North America, Bethesda, Maryland, announced a new set of UV 3D printing educational activities featured as part of uv.eb WEST 2015, March 10-11, in Redondo Beach, California. Conference presentations included Jason Lopes, Legacy Effects, discussing the use of 3D printing as a tool to create special effects in movies such as “Iron Man” and “Robocop;” Brian Adzema, Autodesk, talked about Ember – the company’s UV-powered 3D printer, which marks its first venture into hardware; Mike Joyce, B9 Creations, discussed developing a UV-curable, consumer-focused 3D printer; and Dr. Mike Idacavage, PL Industries, gave an overview of 3D printing technologies. At the event, Dr. Idacavage also previewed his new online 3D printing course – Basics of UV-Curable 3D Printing – produced by SUNY ESF, in partnership with RadTech. This course provides an overview of the chemistry and technology behind UV 3D printing and showcases the science enabling 3D processes, such as SLA, DLP and inkjet. A UV 3D printing committee also debuted at the Redondo Beach event, with a focus on technology and education, as well as the development of appropriate and consistent environmental, health and safety documentation as a resource for 3D printing suppliers and users. “UV-cured 3D printed products often are considered the highest quality currently achievable,” said Dr. Idacavage, chair of the new committee. “In order to make the best use of the capabilities of UV-curable 3D printing, it is very important to have a solid understanding of the many factors involved. RadTech, through uv.eb WEST and the UV 3D printing committee, is positioned to serve as one of the best resources for anyone interested in this technology.” For more information, visit radtech.org. RadTech International North America, the nonprofit trade association for UV and EB technologies based in Bethesda, Maryland, has named its 2015 Board of Directors. Officers include President Peter Weissman, Quaker Chemical Corporation; President-elect Lisa Fine, Joules Angstrom UV Printing Inks; Immediate Past President Don Duncan, Wikoff Color; Secretary Eileen Weber, RedSpot; and Treasurer Paul Elias, Miwon North America. Newly elected board members include JoAnn Arceneaux, Allnex USA Inc.; Mark Gordon, INX International Ink Company; Nikola Juhasz, Sartomer Division, Arkema Group; George McGill, Zeller+Gmelin Corporation; Alexander Polykarpov, AkzoNobel; Jeremy Teachman, Sun Chemical Corporation; and Xiasong Wu, DSM Functional Materials. Returning board members include Jennifer Heathcote, Phoseon; Beth Rundlett, Katcheco Inc.; Rick Baird, The Boeing Company; Joshua Lensbouer, Mannington Mills; and Aaron Smith, Kimball. For more information, visit radtech.org.